We know that bacteria is all around us, but how can we limit the amount of bacteria on our toothbrushes? 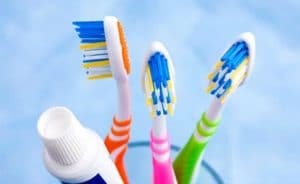 Toothbrushes play an important part in our everyday lives, so it is essential to keep your toothbrush in tip-top shape. Follow the tips below to ensure your family’s toothbrush hygiene and oral hygiene safety. Toothbrushes are not required to be sold in a sterile package, so as soon as you take your new toothbrush out of the box, rinse it well with warm to hot water for 30 seconds. It is also a good idea to rinse your toothbrush with warm to hot water after each use to remove any debris or leftover toothpaste. Never cover your toothbrush bristles when wet. Germs thrive in dark, enclosed environments, so always let your toothbrush dry before covering. Replace your toothbrush every 3 months at minimum. Replace sooner if the bristles become worn and frayed. Children’s toothbrushes often need replacing more frequently than adult's. Always replace you or your child’s toothbrush after having an illness. This will help prevent the illness from continuing to spread. Also, if you have a sick loved one in your home, they should use a separate tube of toothpaste to prevent germs from traveling from the tip of the toothpaste tube.